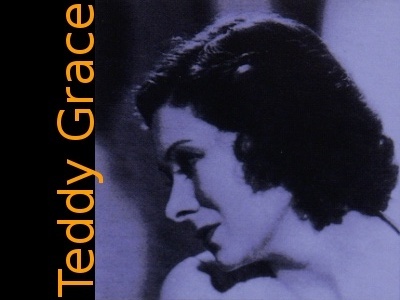 Teddy Grace CDs @ Hep Records, jazz in depth from the 1930's to the present day. Teddy Grace was born June 26,1905 in Arcadia, Louisiana. This would be considered the "deep south", and although she was born into a prosperous white family and studied music she was drawn to the pervasive black music culture of the region. She married young and settled in Montgomery, Alabama and enjoyed the benefits of an initially successful domestic life. However as a result of an impromptu "party piece" song at a local country club she was bitten by the jazz bug. By 1933 she was widely heard on local radio stations and soon found herself singing in New York with some well regarded musicians. A contract with Mal Hallett, a successful New England based bandleader followed and helped spread her reputation via records and more radio exposure. Her marriage had by this time foundered and as a result of the touring strain she decided to leave Hallett and try for domesticity once more. But as before the lure of the music drew her back to Hallett and a Decca Recording contract. Her vocal quality of earthy gruffness and effortless swing often caused listeners to imagine her as a "black" performer which was underlined by a series of recordings she made with Bobby Hackett, and a little later Jack Teagarden and Billy Kyle. In the summer of 1939 she joined the Bob Crosby orchestra and enjoyed the musicianship of Irving Fazola, Eddie Miller and Billy Butterfield amongst others on her performances during this time. She only made another couple of sides in 1940 before suddenly joining the Woman's Army Corps. She decided she could best serve her country by performing at recruiting and bond drives. Sadly this put an even greater strain on her voice which gave out following an extended War Bond tour in 1944. She never sang professionally again and disappeared into obscurity. A dedicated fan David McCain subsequently tracked her down to LA Nursing home in 1991 and prompted a reissue of her classic 30s recordings on two or three specialist labels. She died january 4, 1992 but not before she realised that there were people still listening to her songs. Teddy Grace - "I'll Never Let You Cry"